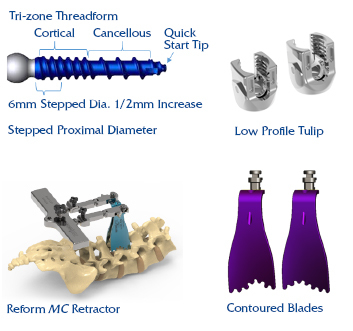 The Reform® MC Posterior Lumbar Fusion System utilizes a minimally disruptive approach designed to reduce muscle retraction laterally past the facet joint. This approach requires a smaller incision while maintaining direct visualization and access to the disc space. 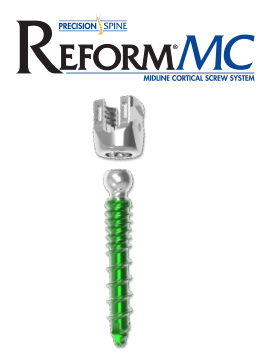 Reform MC’s medial to lateral trajectory, combined with a cortical cancellous screw thread design, achieves greater cortical bone purchase. Reform MC features a modular screw design to maximize visualization and a low profile, cobalt chrome, tulip to conserve space without compromising strength.